The Macula Vision Research Foundation (MVRF) and VisionCare, Inc. have formed a unique partnership of industry and philanthropy to benefit more than 15 million people in the United States with age-related macular degeneration (AMD). The goal of this partnership is to increase awareness of potential treatments for AMD including the CentraSight treatment program, which includes the telescope implant, a device proven to restore central vision and improve quality of life in those with end-stage (advanced) macular degeneration. 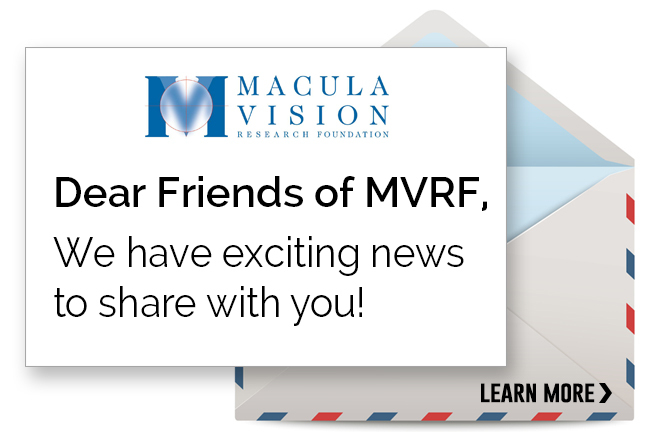 MVRF is a leading national nonprofit focused on funding research to find a cure for macular degeneration and other retinal diseases. To reach this goal, MVRF funds groundbreaking research projects conducted by the world’s top scientists with the hope of improving the lives of millions of people affected by visual impairment. VisionCare, Inc. is engaged in the research, development, manufacture and marketing of proprietary implantable ophthalmic devices and technologies that are intended to improve vision and quality of life for individuals with untreatable retinal disorders. The collaboration between MVRF and VisionCare is centered around MVRF’s SupportSightSM program, the national education and outreach arm of the Foundation which includes three components: SupportSightSM seminars, free educational seminars in cities across the country, SupportSightNewsSM, MVRF’s newsletter with a circulation of more than 30,000 and SupportSightSM resources which includes a toll free number, outreach, retirement community partnerships, online and digital resources, referrals and access to disease-specific information and clinical trials. A top priority of the program is to provide the latest and most credible information to help people with macular degeneration learn more about viable advancements and connect them directly to specific opportunities that may be right for them. Through the partnership, MVRF and VisionCare will raise awareness about the potential benefits of the telescope implant for patients with profound vision loss in both eyes. Recent changes in eligibility have allowed this treatment to become more available to a wider range of patients. For more information about the telescope implant, please call MVRF at 1-866-462-2582 or visit http://www.mvrf.org. VisionCare, Inc., headquartered in Saratoga, CA, is a privately-held company. The company is focused on the development, manufacturing, and marketing of implantable ophthalmic devices and technologies that are intended to improve vision and quality of life for individuals with End-stage Age-related Macular Degeneration. VisionCare’s Implantable Miniature Telescope was invented by company founders Yossi Gross and Dr. Isaac Lipshitz. Information on VisionCare can be found at http://www.visioncareinc.net. The Implantable Miniature Telescope (by Dr. Isaac Lipshitz) is indicated for monocular implantation to improve vision in patients greater than or equal to 65 years of age with stable severe to profound vision impairment (best-corrected distance visual acuity 20/160 to 20/800) caused by bilateral central scotomas (blind areas) associated with End-Stage AMD. The device holds FDA (PMA) approval, CE Mark, Health Canada Listing and is manufactured in an FDA registered facility. The telescope implant is not a cure for End-Stage AMD. As with any medical intervention, potential risks and complications exist with the telescope implant. Possible side effects include decreased vision or vision impairing corneal swelling. The risks and benefits associated with the telescope implant are discussed at http://www.CentraSight.com. If you’d like more information about this topic, or to schedule an interview with Blake Michaels, VisionCare, Inc. or Dawn Prall George, Executive Director, Macula Vision Research Foundation, please call Dawn at 610-234-0091 or email her at Dawn(at)mvrf(dot)org.